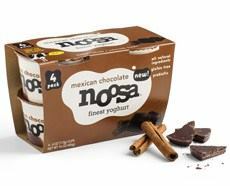  and  Buy lots—you’ll love Noosa Mexican Chocolate Yoghurt (photo courtesy Noosa). 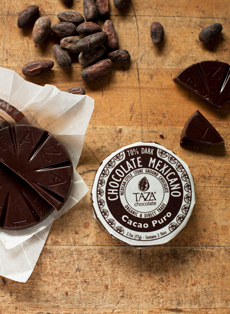 Actual Mexican chocolate is melted into hot chocolate (photo courtesy Taza Chocolate). In the rear: the roasted cacao beans from which chocolate is made. 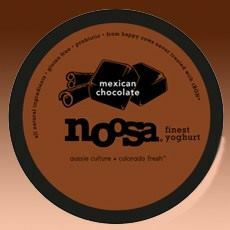 Noosa Mexican Chocolate Yoghurt (that’s how yogurt is spelled in Australia). We’ve tried other brands’ attempts at chocolate yogurt, but they had only a hand-shaking acquaintance with chocolatey indulgence. Noosa gets it right. One of our favorite brands and a Top Pick Of The Week, Noosa is a whole-milk yogurt, which gives it the richness and creaminess of a good dessert. The new Mexican Chocolate flavor is ¡delicioso! It’s made with Fair Trade cocoa powder, a splash of cinnamon and a dash of cayenne. It leaves you saying “Mas! Mas! Mas!” and recommending it to every yogurt-eater you know. We promise! WHY IS IT “MEXICAN” CHOCOLATE? Cacao was first cultivated in Mesoamerica by the Olmecs, around 1200 B.C.E. ; who taught it to the Mayas, who taught it to the conquering Aztecs. In the New World it was a beverage for the wealthy and elite, an unsweetened beverage, flavored with cinnamon, chiles, cornmeal, musk, peppercorns and vanilla. The Spanish conquistadors, who arrived in 1527, didn’t like the drink at all. But they brought the beans back to Spain, where chefs “Europeanized” it with milk and sugar, keeping the cinnamon but leaving out the chiles, cornmeal, musk and peppercorns. In the 19th century, a method for making hard chocolate bars was invented in England. The technique traveled back to the land of origin, where Mexicans flavored their hard chocolate with cinnamon, sugar and almonds. But, true to tradition, they turned those hard disks back into a beverage: hot chocolate! Here’s a history of chocolate timeline. And for true foodies, here’s the full history. Test your knowledge of chocolate in THE NIBBLE’s Chocolate Section. You might want to start out with our Chocolate Glossary: all the terms you need to know to become a chocolate expert.